This article is the first in a series that will introduce two very important facilities that can be used when creating DATS worksheets – Named Elements and Global Variables. It is perfectly possible to perform simple measurement and analysis with DATS without knowingly using either of them. However, knowing how they work and what they can do, will lead to much more efficient and flexible worksheets. The first subject we’ll look at is Named Elements. Captured data. Whenever you capture data using a Prosig P8000 system, the data will be created with a whole set of NEs already in it. These range from vital information about signal, like its name, description & units to useful data about the setup used to capture the data. These include information such as the time & date when the system was armed, transducer sensitivity, transducer types and so on. Generated data. 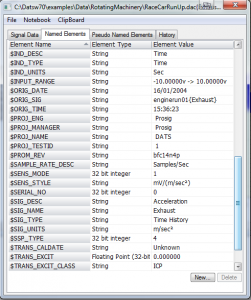 If you generate a signal in DATS a basic set of named element information will be added. Analysis information. Consider an analysis such an auto spectrum. When we perform this analysis we chose parameters such as the amount of overlap, type of windowing to use and so on. This information is stored back in the resulting signal so we can refer to it later. 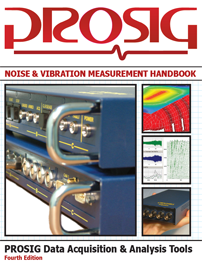 In addition this particular analysis calculates values that qualify our results such as statistical degrees of freedom and equivalent noise bandwidth. Again, these are stored with the data in NEs so that we can review them later. Project information. If we use the DATS Project Manager to classify our data then all of the information about our current project is stored with any data we create. User information. Finally, but equally as importantly, you can add your own NEs to any signal. So if you have information that needs to be stored with the data it is a straighforward task to add it to the NEs. You will notice that Prosig always prefix their NEs with a $ sign. This means that users are free to use any naming convention they chose with no danger of clashing with names used by DATS. Provided you don’t use a $ as your first character, of course! Let’s consider how DATS uses NEs. As we’ve already seen, all data is created with NE’s and certain functions will add NEs as part of their analysis. Additionally, all NEs are copied from the input signal to the output signal when we perform an analysis. So as we step through our processing we build up a complete ‘story’ of our data in our NEs. Often, DATS analysis functions refer to the NEs when processing the data. For instance, some functions may need to know the type of a spectrum they are processing in order to carry out the correct analysis. This information would be found from the signals NEs. Additionally, there are several important details about a signal that are stored in NEs. Information such as signal description, signal units and independent variable name & units are all stored as NEs. 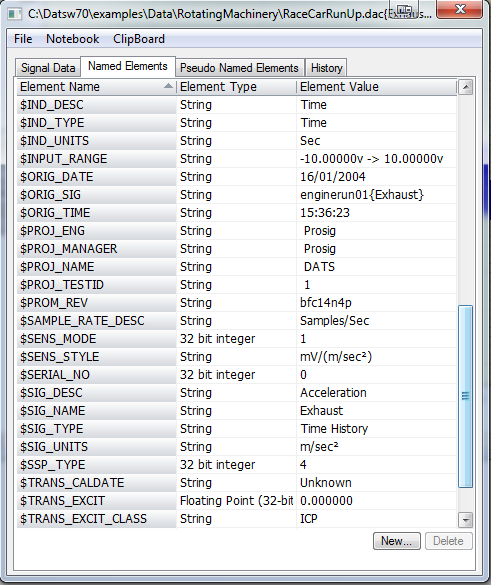 The screenshot below shows a a few of the Named Elements for a signal in one of Prosig’s example datasets. In the next part of this tutorial we will look at how we can use Named Elements in worksheets.